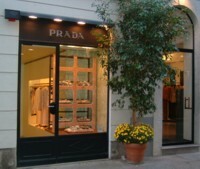 For designer clothing and jewellery, head for the network of pretty streets around the Montenapoleone Metro station. The so-called 'Quadrilatero d'Oro' ('golden quadrilateral'), is the place to come for designer shopping. The area is bordered by Via Montenapoleone, Via Sant' Andrea, Via Borgospesso and Via della Spiga (where the street smells of cloying perfume, expensively-clad shoppers look down their noses, and shop assistants pose outside doorways and look straight through tourists ... probably an essential part of the Milan experience). More affordable clothes-shopping experiences can be found along Corso Vittorio Emanuele, between the Duomo and Piazza San Babila, and around Via Torino, the other side of the Duomo. Around the hip Navigli area and up Corso di Porta Ticinese there are some interesting boutiques selling a mixture of retro, vintage and cutting-edge clothing and accessories. 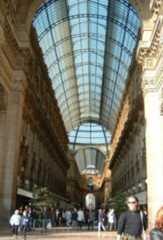 For a more classic shopping experience, try the historic Milan department store La Rinascente, next to the Duomo. There's a fantastic food department on the top floor. Milan is famous for quality design - showrooms are dotted around the central area, but there are concentrations around the San Babila (Metro Line 1) area if you want to wander and browse. Products to look for include lighting, home furnishing, interior design, silver, glass, mosaics. Milan's tourist information offices should be able to give you a map and list of design showrooms.